It’s truly been a long time since I’ve come across a game that oozes with fun, joy and even wonder. When it comes to gaming, recently, we’re often thrown into worlds with intense narrative, a best push for the best graphics and an ever increasing amount to remember on the control pad. 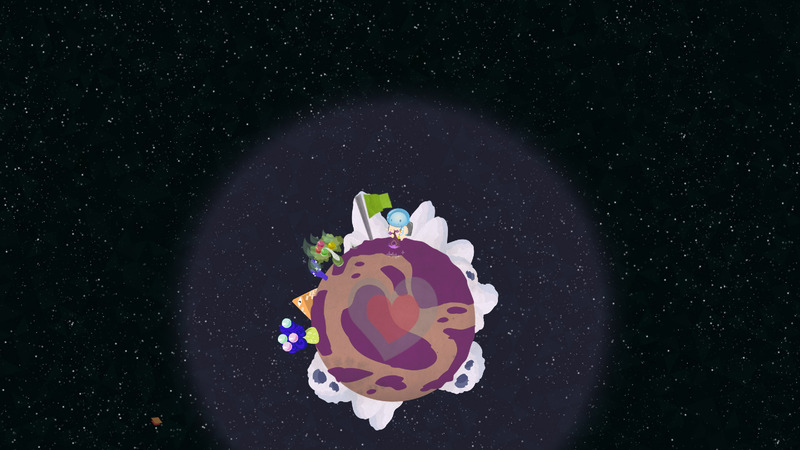 With Cosmochoria, I feel its something I can get into and just relax while playing. It’s simple, looks beautiful and it’s quite simply fun to play. Developed by illustrator and musician Nate Schmold at 30/30, a studio in Canada, it’s clear to see a key focus on this game is the look and sound. This game takes place in the vast vacuum of space and the look and sound does a good job of making it seem that way.There’s a layer to the background that makes the setting seem never ending and mysterious. There’s so much of it to explore in the game that it takes the 2D look and adds that little extra perception to make the player feel alone in the galaxy. We start with a grey planet, a dead Planet if you will, which we have to restore back to life. On doing so, you build up the colours around you with plants, turrets and flags, even the planet gains colour that is wonderful to see. The music in the game is subtle and matches the feeling of what the imagery and presentation gives us. It’s sparce and empty yet the ambience feels warm. However, at certain times in the sound track there will be notes here and there that have a slight harshness to them but it’s there to provide a certain feeling and works well in doing so. The game involves a little chubby naked space man with a fish bowl helmet, jet pack and gun. Putting funny aside, his design works well to tell you what this game is like to play from the start. It’s simple, it has humour and you will need that gun! We start on a barren planet with the objective to restore it’s life by planting bright green plants with colourful leaves to create an atmosphere, which in return, allows you to heal. As well as space foliage, we can also use turrets to defend us and our temporary home. From what I hear you ask? Are we alone in the universe? Impossible! For some reason, what ever is out there doesn’t like your garden work. 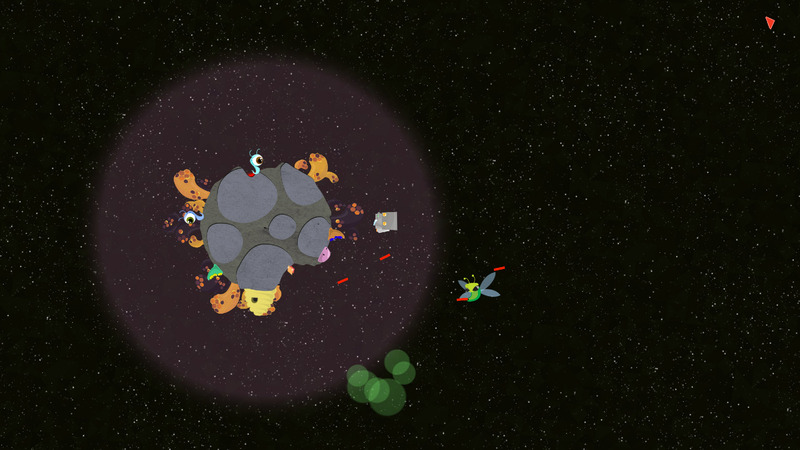 UFO’s descend from space shooting at you and dropping off aliens onto your planet to try and stop you. While planting and pressing down the ‘S’ button, our little space nudist becomes immobile and unable to fire back at the incoming invaders. If you find yourself close to building the planets atmosphere and taking incoming bullets, the game creates a wonderful balance of shoot, plant, run, plant, shoot back. When leaving the planets gravitational pull, you can use your jet pack to accelerate through space. 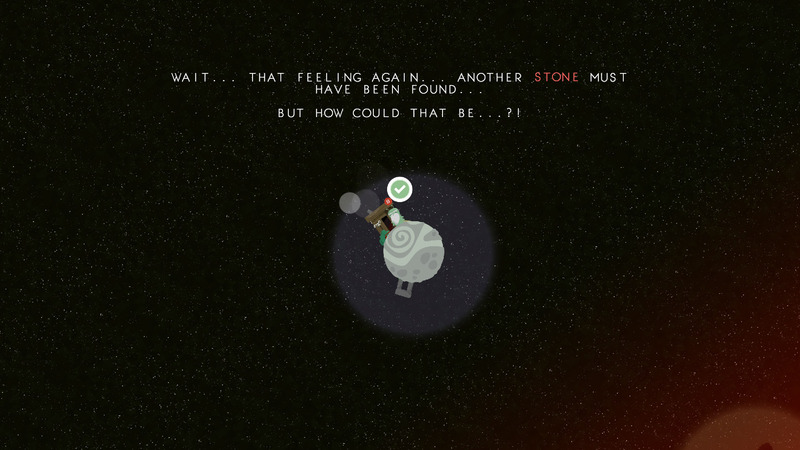 The gaps between planets can sometimes feel far, however in this game there’s never really a sense of being lost. You simply feel like you’re discovering more. There are secrets to uncover and a story to be told. although, if you’re not too bothered about a narrative, this game works perfectly without one. There’s a feeling of grinding to the game as we can level up our protagonist between deaths so dying doesn’t ever seem too harsh on the player. My only issue to the upgrades was the Jet Pack in particular as I got used to floating around and drifting leisurely through space and once I did upgrade it I lost control a few times, although it is very useful when avoiding fire. If possible, try to heal planets that are close by. Once you’ve healed so many planets, you will trigger a boss fight. The only issue here is that it isnt exact. Apparently it takes a number of planets to active a boss battle, however it’s not immediate and sometimes it feels a little random but to me, this adds to the intensity and makes the galaxy feel alive. Here’s where the game can get tricky. regular aliens take a few hits but bosses have a health bar that fits the top of the screen in its entirety. oh yeah and by the way, one of the bosses I came across was a space dragon! Where regular bad guys can land on the planet, the space dragon flies through space and also through planets, however, there are brief moments that allow us to take cover from its fireballs on the other side until it gets too close. The learning curve in the game isn’t too bad but these bosses take a serious amount of time and bullets to kill, however the pay off is worth it! As I said at the beginning, it’s been a while since I’ve played a game that is just sheer joy to play. Cosmochoria is that in a nutshell! I definitely recommend this as a game to play at any point in the day, as a game to complete and discover everything this game has to offer, and if you play games casually in your spare time. Your time will be well spent enjoying a fun filled adventure through space with action and the option of narrative. With the ability to upgrade your character and grow planets back to health, the wonderful soundtrack, and the bright colours that contrast the bleakness of space makes dying is all a part of the process. It never feels like a stressful game, although grinding has it’s rewards. It feels endless and vast and has a great ability to draw you in to getting immersed in space. At £6.99 on Steam I highly recommend you grab this game while you can! This entry was posted in Uncategorized and tagged 30/30, Cosmochoria, Indie, PC, Steam. Bookmark the permalink.